The wide streets that we have in Lansing could lend themselves to linear parks or "pedestrian greenways". Greenways that connect the developing districts that provide beauty, shade, and safety. In some places, they could include dedicated bike/scooter lanes. All while keeping vehicle traffic on the same streets. Here in Michigan vehicle traffic is part of what animates a street, busy with traffic feels like there is something going on there. It would be nice to separate the two giving a bit more to the pedestrian side while keeping the access for traffic. Great points, I love this idea for Lansing roads. Mayor Andy Schor today announced that the City of Lansing has been awarded a $39,400 grant from the National Parks Service to tell the story of the impact of the construction of I-496 on Lansing’s vibrant African American community. 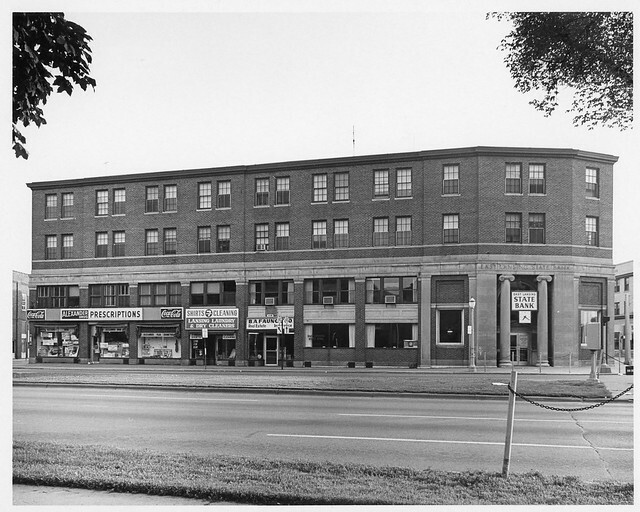 The community was centered on Main Street (now Malcolm X Street) and St. Joseph Street between Washington Avenue and Clare Street, prior to being displaced due the project. More than 840 homes and businesses in the heart of the African American community were demolished to make way for the expressway. The impact study of the dislocation will explore what is thought to be a chain of events that included an acceleration of white flight to the suburbs, redlining, bussing, construction of public housing and ultimately the integration of Lansing neighborhoods. The Historical Society will work with the African American community to collect oral histories from those affected by the dislocation. The Historical Society will also recreate a virtual community showing the homes and businesses destroyed using archived photographs from the Stebbins Real Estate Collection and the Belon Real Estate Collection at the Capitol Area District Library Local History Room. Users will be able to click on locations along I-496 to view photographs and detailed information of the homes before they were demolished, as well as gather information about who lived there and where they moved to as result of the dislocation. The grant also details lost grocery stores, dry cleaners, cafes and other businesses frequented by African Americans. I have been in a couple of discussions about the I- 496 project and its effects on the city and the people who lived in the path of the highway on the Lansing Historical Society's Facebook page. It is very interesting to hear the stories of people and places that only exist in our memories. Many people who did not live here then or who are not old enough to remember have lots of questions about what happened. I am afraid that some people have a problem with the idea that "one reason" they built the highway where it is was to get rid of the older African American neighborhoods. Some think that having that opinion is somehow a liberal misreading of history, that liberals are even wrong about the reason for the Civil War and liberals have only harmed the Black community. This is the first Facebook blog I have ever participated in, so I may be quite naive about these things, is it usual to find folks posting such nonsense, and then go on to say that I must have some sort of mental disorder for pointing out that they are wrong? I guess the point is I should not care if some guys out there are just plain ignorant, or they like trolling sites to spread their ignorance and get their jollies. Sorry, it's really the first time I have tried to communicate with this sort of person, I found it sad. Back to this project, the pictures of the area and the whole building project's progress are the best part. The whole thing took a very long time and when it was done I had a strong feeling of "this is it!?" The LSJ did a good piece, Thursday, on the 1999 Cedar Village riots in East Lansing after MSU's loss to DUKE in the NCCA tournament. I still remember vividly seeing it on the news that night. EAST LANSING -- Hindi Linkimer Burkett’s gray 1987 Chevy Nova was a gift from her sister-in-law. It had a saggy roof and a cassette tape player. And, 20 years ago, she watched from the balcony of her Cedar Village apartment as a swarm of people turned it over and shoved it into a bonfire. Burkett had a front row seat to the most destructive event in East Lansing's history, the March 27, 1999, riot that followed the Michigan State University men’s basketball team’s loss to Duke in the NCAA Final Four. That night, a crowd of a few hundred swelled to 10,000 and raged through the streets, propelled by a volatile mix of alcohol, disappointment and youth. Arsonists and vandals destroyed eight cars, among them a DeWitt Township police cruiser. They broke store windows and parking meters, tossed frozen beer cans from balconies and raided a Taco Bell, fleeing with stolen tacos. I hope that this coverage doesn't give current students ideas for this year. If you read the story, it does quite the opposite. It also mentions things the university has done and a general change in culture why subsquent "celebrations" have become much more mild. There is a whole thing about this during orientation that students didn't use to get prior to that riot. I remember back then how MSU and Arizona State were always in the Top 10 party schools categories. This isn't as much the case, anymore. As the article says, with tuition having gone up so much, students are much more serious about protecting their education, and more of them have to work to stay in school. Another big factor they bring up is technology, and how since everyone has camera phone, it's easier to get caught, so doing this stuff has kind of been a deterrent. Anyway, another interesting thing about this riot is that it was the impetus behind the failed reworking of Cedar Village and ultimately the form-based code for the area. It's why I was so surprised a few years back when they first started talking about developments like The Hub in that area. They'd spent the years after the riots doing everything they could to push students out of Cedar Village and break up the student ghetto. This is looking northeast from the corner of Grand and Shiawassee. Really crazy to see old pictures of North Grand and North Washington. Storefronts used to stretch all the way up to Saginaw. Old Town and downtown must have felt much, much closer than they do, now, before the construction of LCC and Riverfront Park. This is looking northeast at the corner of Grand River and Evergreen. This would be the southwest corner of the old State Savings Bank Building demolished a few years ago.